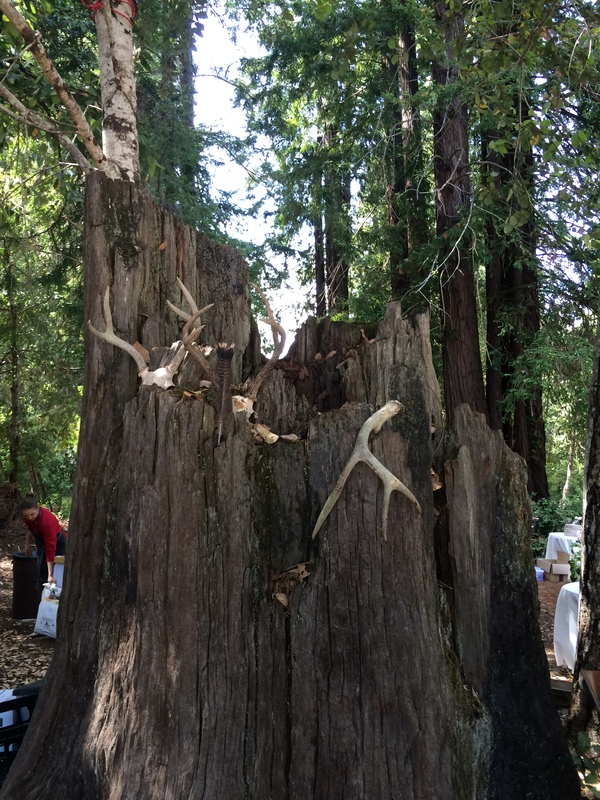 A few weeks ago, I attended a wedding in Northern California’s Anderson Valley, where both the bride and groom grew up, and which is increasingly recognized as a choice region for Pinot Noir, Gewürztraminer, and Chardonnay. The ceremony and reception were both held at a local winery, in a redwood grove tucked up a vineyard-lined hill behind the tasting room. 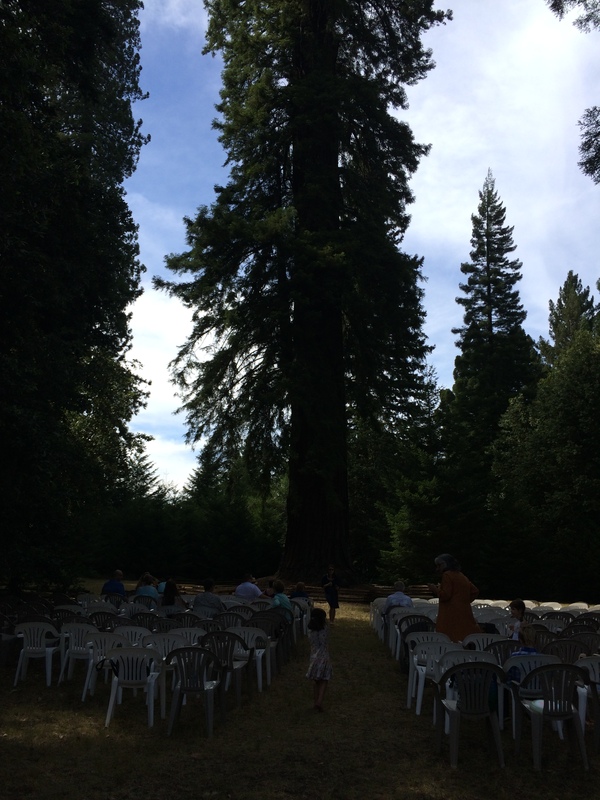 This tall tree provided the backdrop for the ceremony. Sorry for the terrible picture quality – it is dark under such massive redwoods! It was the first wedding I’ve attended in Northern California, and it gave me a deep appreciation for how beautiful a celebration in this region of the world can be, especially when supported by a strong community. The couple very clearly wanted to incorporate the people they love, and who love them: one friend officiated, another coordinated the flowers, yet another made the cake and decorated it with roses, and still another carefully designed a dance-friendly, hours-long playlist. The wedding cake, filled with poppy seeds, was one of the best I’ve had; I frown on fondant. The couple mingled with guests before the ceremony, the bride popping bottles of champagne for distribution and consumption long before she exchanged vows with her betrothed. 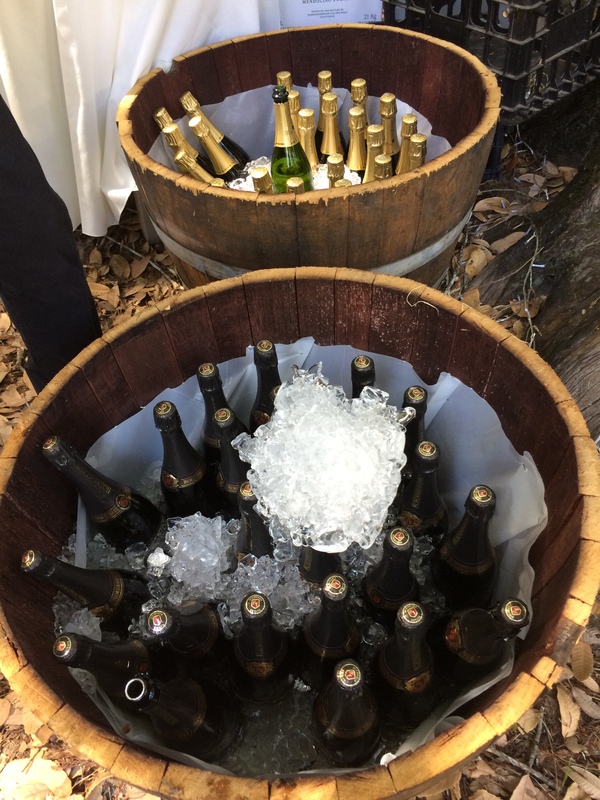 I was struck by the casual, loving, and enthusiastic atmosphere; guests drank champagne not only because – well, champagne is delicious and should be consumed frequently – but also because the occasion was imbibed with an effervescent joy that paired oh-so-well with bubbles. I don’t even need caviar dreams when I’ve got buckets of champagne nearby. I found myself reflecting on the weddings I’ve attended. The ones that have been the most wonderful are those that reflect the couple; it has nothing to do with cost or level of formality. Expensive weddings can of course be a blast, but some of my favorite weddings have been those that were, like this one, put together by a team of people, acting with joyous love for the couple. We are, in our society, filled with language that emphasizes perfection when it comes to weddings, but – just like anything in life – that’s a dangerous game to play, especially when someone else is writing the definition of the word. This wedding was gorgeous, memorable, delicious, fun, and a true celebration of two people’s commitment to one another. I won’t try to tackle the ridiculous wedding industry that thrives today, but I know enough to know that it would have recoiled at the end of this ceremony, when we were asked to each carry the plastic chair in which we’d just sat over to the reception tables. But who cares? Not me: I passed a happy bride and groom along the way, who accepted well-wishes from their beaming guests in the form of hugs, cheers, and raised glasses. Plus, the lucky coincidence is that I have two hands: exactly enough to carry the chair in one, and my ever-full champagne flute in the other. What’s a wedding without antlers? As the newlyweds and their guests celebrated, the skies turned from afternoon into evening, and eventually darkened with the star-filled night. The redwoods and vineyards cradled the celebration, so that I almost imagine it could be seen from above, a warm glow emanating from a tiny corner of the world. What a joy to be a part of it; what a lovely way to celebrate love. This entry was posted in California. 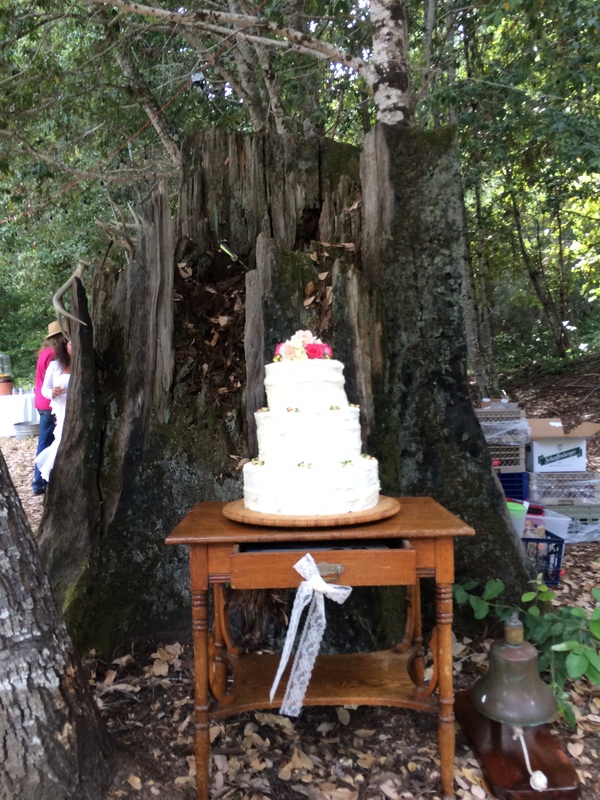 Tagged Anderson Valley, celebration, love, redwoods, vineyard, wedding, winery.